This is College Physics Answers with Shaun Dychko. We begin by writing down the information we're given. The wavelength is 410 nanometers for the violet light that is going to be incident on these two slits. 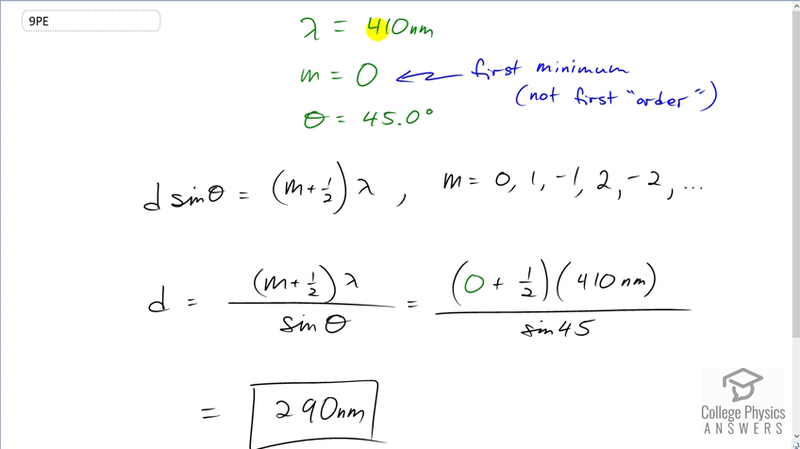 The angle to the first minimum is 45 degrees and when you're thinking about what value <i>M</i> should have in this formula here for the minima through a double slit, the first minimum is at <i>M</i> equals zero. It's not going to be one because it's not asking for the first order minimum. Instead, it's asking for the first minimum, which is <i>M</i> equals zero. So, the minima is going to be the distance between the slits times sine of the angle to the minimum. That equals the order of the minimum plus a half times the wavelength. So, we can solve for <i>D</i>, the distance between the slits, by dividing both sides by sine <i>Theta</i> and we get the distance between slits, then, is <i>M</i> plus a half times <i>Lambda</i> over sine <i>Theta</i>. So, that's zero plus a half times 410 nanometers divided by sine of 45. And because I left this in units of nanometers, our answer is also in units of nanometers and that will be 290 nanometers is the separation between the slits.